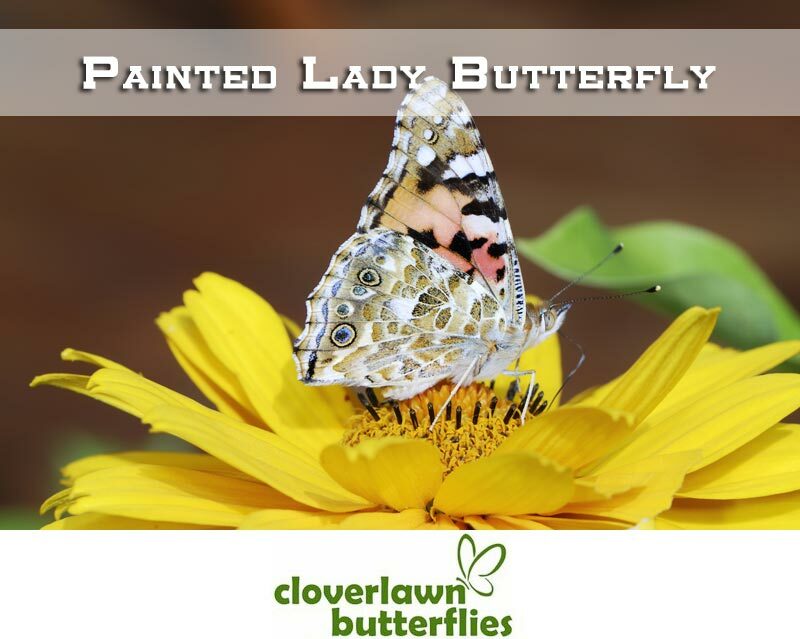 Cloverlawn Butterflies Butterfly Release Company is a small, family operated butterfly farm that provides Painted Lady butterflies for live Butterfly Release Wedding ceremonies and other special events. Cloverlawn Butterflies is headquartered in Orlando, Florida but ships all across the United States. There are approximately 20,000 different species of butterfly spread out across the globe. No matter what their species, all butterflies carry a significant amount of symbolism on their delicate little wings, including love light and joy. Much of their symbolism has romantic influence. Butterfly Release Wedding at Ed & Erika’s Wedding Ceremony. This influence can be found in various cultures all over the world, some cultures dating back thousands of years. So, what makes the Painted Lady Butterfly (also known as Vanessa cardui) ideal for butterfly release wedding ceremonies? The Painted Lady stands out amongst the rest for several reasons. The first is simply because of its size. This particular butterfly is one of the largest species in existence, measuring approximately between 5 and 7 centimeters. It is also quite bright, having exquisite orange and black wings that cannot be missed. So, no matter how big or small your wedding ceremony, all of your guests will be able to see, and marvel in, the beauty of such a unique display. Butterfly Release Wedding at Jon & Trish’s Wedding Ceremony. Painted Lady butterflies have a different flight pattern than most other butterflies. While many butterflies flit about in an erratic manner, which makes it hard to keep your eyes on them, the Painted Lady floats slowly and gracefully from place to place. More than that, they are more sociable than other species of butterfly. Where some may scatter as soon as you make a movement, Painted Ladies will float about amongst you and your guests, landing nearby. Some guests may even be fortunate enough to have a butterfly land on their dress or jacket. Butterfly Release Wedding during Lindsay & Joey Miller’s Wedding Ceremony. Finally, Painted Ladies are native to the entire continental United States, and can be found all over the world (with the exception of Australia and Antarctica). This means that they can be shipped and released anywhere in the continental U.S. Releasing butterflies for your wedding ceremony is an experience as unique and special as you are. It’s this reason why Cloverlawn Butterflies Butterfly Release Company offer two types of butterfly release packages that are customizable to your needs. A mass release involves the release of a group of butterflies from a single decorative box. The release is usually performed by one or two people, in this case, you and your partner. No matter if you choose to release your butterflies after you exchange your vows, after you share your first kiss, or after you have walked back down the aisle, the process is simple. All that you need to do is give your box a gentle shake, which will give your butterflies a bit of motivation, and lift the lid. The sight will be something your guests won’t soon forget. 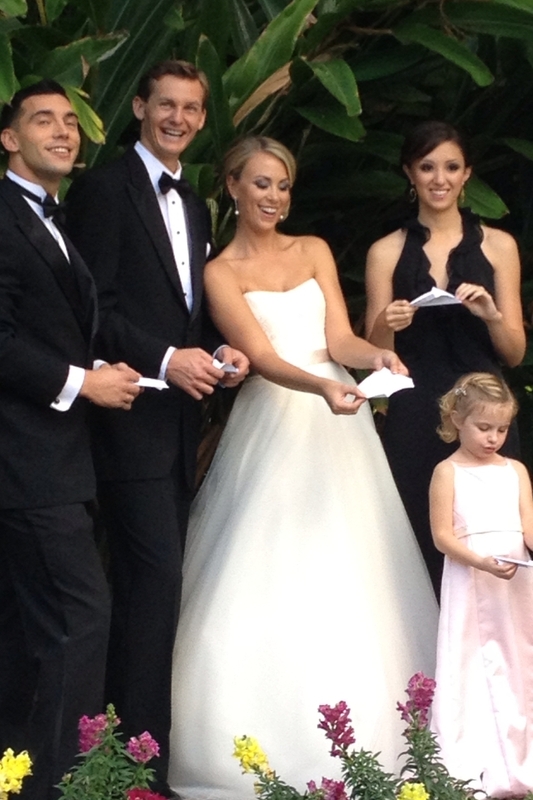 An individual butterfly release allows each of your guests at your special occasion or event to take part individually. Each guest gets a customized envelope with a single butterfly inside. For Individual Butterfly Releases, you can choose envelopes that you can customize. Customizations include their color and you can have text inscriptions on them. Once the butterflies are released, these envelopes then get to become keepsakes for you and your guests during the event or special occasion. 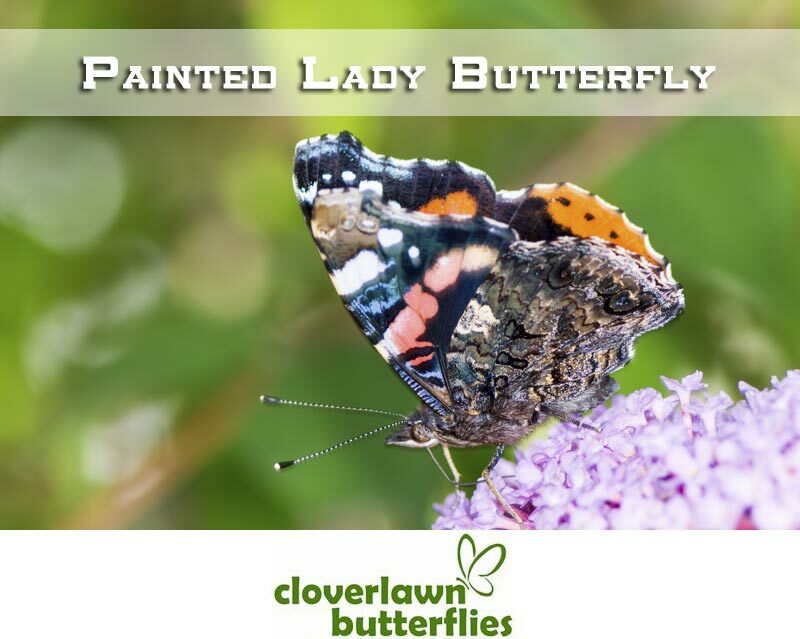 Cloverlawn Butterflies Butterfly Release Company hand raises the Painted Lady Butterfly for their butterfly release packages, which are guaranteed to arrive alive and on time for your butterfly release wedding ceremony. 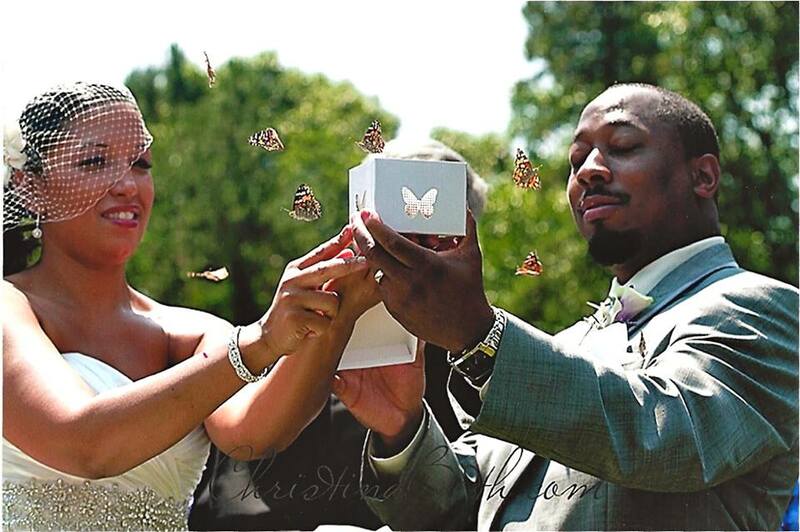 Curious on how to release butterflies for your wedding ceremony? Learn how by visiting their Butterfly Release Instructions page. 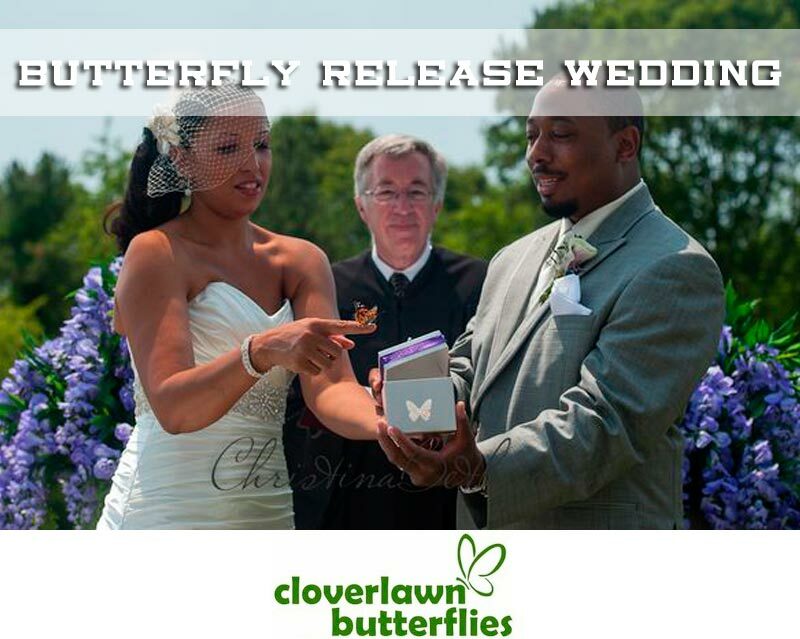 Cloverlawn Butterflies offers several different butterfly release wedding packages for you to choose from, and every order is tailored to meet your special needs with the ability to customize them. 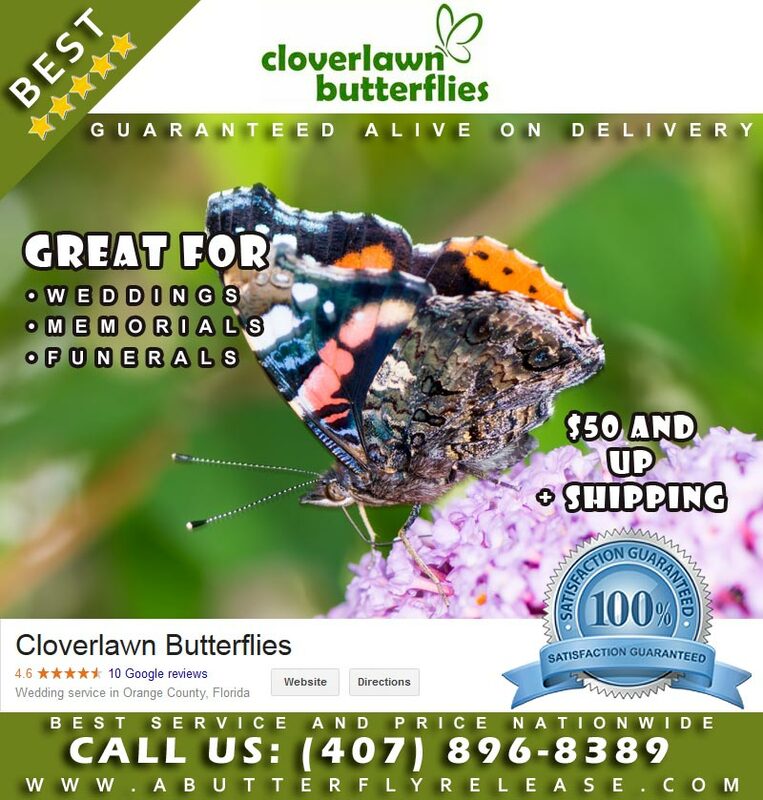 Cloverlawn Butterflies is the premier Butterfly Release Company due to great customer service, quality butterfly release products, great reviews online and more. Releasing Live Painted Lady butterflies for your wedding ceremony is the perfect way to celebrate your union. Order your Butterfly Release Wedding packages online from Cloverlawn Butterflies or call them today at 407-896-8389 to place your order.